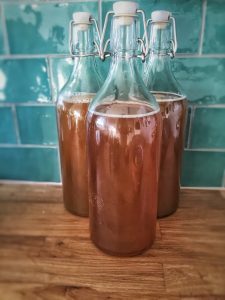 Kombucha – the fermented beverage the ancient Chinese called the ‘Immortal Health Elixir -’ has been around for more than 2,000 years preventing and fighting cancer, arthritis, improving digestion and immunity, fighting candida overgrowth, improving mental clarity, and stabilising mood. It has also been reported to reduce and even eliminate the symptoms of fibromyalgia, depression, anxiety and other degenerative diseases. It’s naturally fermented with a living colony of bacteria and yeast. Kombucha is a probiotic beverage. It’s made from tea that’s been fermented by a colony of bacteria and yeast also called scoby, ‘mother’ or ‘mushroom’. Kombucha started gaining popularity in the 1990′s.